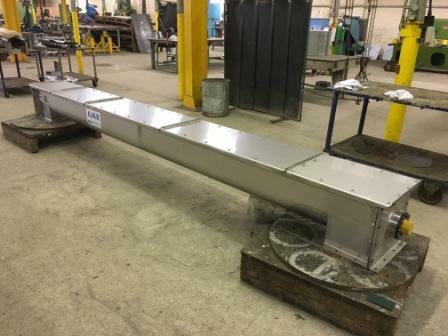 Ajax Equipment, Bolton, UK, has supplied a leading food ingredients supplier with a screw conveyor to replace an existing screw feeder and vibratory feeder. The screw features cut and folded flights to provide mixing as well as transfer of biscuit crumb. Close cooperation with the customer helped optimise the transfer capability and mixing effect within the screw conveyor. The stainless steel screw also includes an inspection window to allow monitoring of material condition as well as a hinged cover and polished welds to ensure ease of cleaning.